This season we went 12-17 which doesn't sound great but is a lot better than what I expected given the lack of talent on the roster. We were one of the lowest scoring teams in all of basketball so finding some offense for the future is definitely going to be important. Our win total is a bit inflated since we scheduled only the worst of the worst, but right now winning easy games is a lot better for our future than losing hard ones. As you can see here we were 346th in points scored and in the 300's in a lot of other categories as well. The two bright spots were that we were #1 in the country in assists against us and #3 in the country in opponents 3 point percentage. None of these matter much though and are simply due to the fact that we played teams so bad that they couldn't hit 3's or generate many assists. Our recruiting class ranked #327 in the nation and #11 in the conference. Here is our roster for the upcoming season! We have 4 seniors this year, and only one of those seniors is someone who will be truly important to us this year in James Reuter. We will be recruiting aggressively as we have 4 scholarship spots to fill. We also have two walk-ons, C Celso Sanz from Bella, Texas and C Terrance Doud from Tracy, California. Both of these guys have the potential to be solid defenders but neither will ever make much of an impact on offense. Right now we are still trying to find the best players available and not letting a need at certain positions get in the way. We are excited at the potential of bringing in a few 3 star guys this year! Here is our preview for the 1939 season! The current goal is still to avoid last place in the conference. Our prestige went up to 2 this year and we are hoping to continue to increase it. Our schedule is not as bad as last year but we still tried to schedule just about the worst teams out there so that we could continue to pick up victories as right now that matters more than having a tough schedule and only winning 4-5 games. This roster is probably about the same talent-wise as last year. We have 3 new players (2 freshmen) in the starting lineup but I'm not sure that at their current stage of development Yager and Mitchell will be better than Rodriguez and Martinez were last year. PF Virgil Yager and PG Douglas Arguello have both been suspended for the first semester of the year due to poor academics. In January they can be re-evaluated. In light of this we have decided to redshirt Arguello. Yager would not accept a redshirt so he will play when he is academically eligible. Tom Johnson and Jonathan Philip will be taking over the SG position and Celso Sanz will replace Yager. Maryland is the preseason #1. 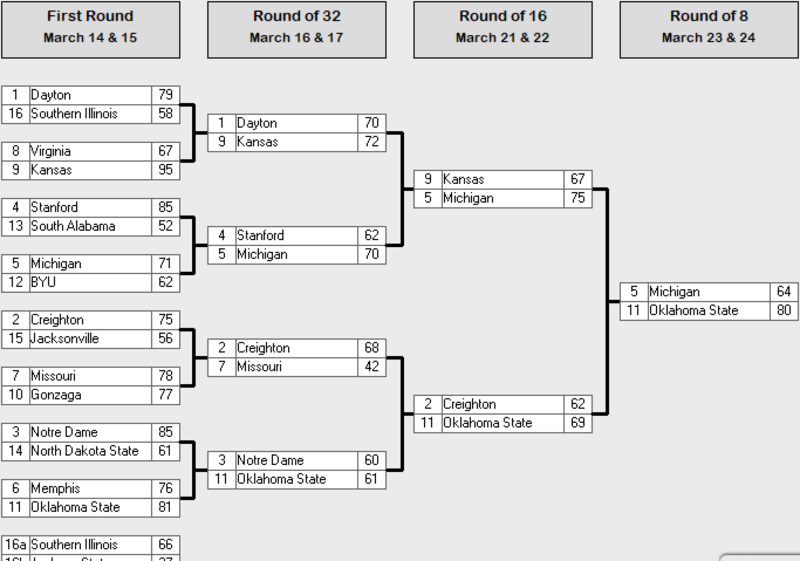 Michigan State and Duke also received first place votes. Final Score: Grand Canyon - 38, Abilene Christian - 39. We were down 18-10 at halftime in what was a brutally low scoring game of awful basketball. Nickolas Toy scored to give us the lead with 6 seconds left on a great pass from Ali Morales and we were lucky to get out of this one with a win. We were 10-21 from the free throw line which is why this one was so close. Celso Sanz had 8 points and 7 rebounds in his debut and Michael Mitchell had 6 points and 9 rebounds. Final Score: Abilene Christian - 55, NJIT - 57. Instead of holding for the final shot we missed with 11 seconds left and let NJIT come down and hit a buzzer beater. This one was a bit frustrating as we got out to a double digit lead but then went on a huge scoring drought. The bright side is that this team does look more competent than last season, even if only by a little. James Reuter had 14 points but they weren't enough. The bench came up big in this one for us with 19 points, led by 9 from Henry Hughes. Final Score: Northern Kentucky - 43, Abilene Christian - 45. This was another low scoring one as we led 16-13 at the half, and interestingly enough all 5 of our starters had exactly 2 points at halftime. Man these have been some close games to start the season! James Reuter had 14 points and Michael Mitchell had 10 rebounds while Celso Sanz had 6 boards to go with 8 points. The bench had 11 points in this one. Celso Sanz fractured his nose in this one and will be day-to-day for 5 days. Final Score: Abilene Christian - 47, Sacramento State - 33. James Reuter had 13 points and Nickolas Toy had 9. Michael Mitchell had 6 rebounds and both Reuter and Jonathan Philip had 5 rebounds. An interesting statline in this one was Russ Kittle of Sacramento State fouled out in only 5 minutes of play! Final Score: North Dakota - 45, Abilene Christian - 56. James Reuter had 19 points, 7 rebounds, and 3 assists in player of the game honors. We were able to comfortable win this one despite committing 19 turnovers to their 9. Jonathan Philip added on 13 points and Celso Sanz had the best game of his young career with 9 points and 13 rebounds. Charles Hurley left this game with a fractured jaw and will miss 17 days. We have two commitments for next season! SF Robert Smith from Abilene, Texas is our first recruit! Smith is a polished inside threat with the potential to be elite, as well as be above average beyond the arc, handling the ball, and on defense. He is a 2 star recruit and #615 in the nation. PG Mark Gagne from Whiteface, Texas is our second recruit! Gagne is a good jump shooter whose value is in his ball handling and distribution skills. Gagne rarely commits turnovers and should be able to rack up a ton of assists. He is a good defender but is elite when it comes to forcing turnovers. He is a 2 star recruit and #725 in the nation. PG Jose Same has declined our scholarship and has decided to attend Weber State. Final Score: Abilene Christian - 40, UMass Lowell - 56. We were absolutely awful in this one as we shot 50% from the line and went 1 of 12 from three. We just couldn't make any shots and shot 33% to their 47%. The crazy thing to is we only had 8 turnovers in this one - which is a rarity in one of our losses. Final Score: Abilene Christian - 48, Cal State Bakersfield - 55. We only committed 11 turnovers in this one but our inability to make free throws or many shots in general cost us again. Nickolas Toy had 18 points with 7 rebounds and tried to will the team to victory. Final Score: Abilene Christian - 45, Maryland-Eastern Shore - 63. Our inability to go on any scoring spree so far this season has cost us dearly. Any deficit by more than 6 points has usually meant that the game is over for us. James Reuter had 15 points and Michael Mitchell had 6 points with 8 boards. Final Score: Abilene Christian - 46, Bryant - 49. In the second half we went from the 13:34 until the 2:15 mark without making a shot. It is amazing we lost by only 3 with that awful of a stretch, but my initial analysis that this team was improved was a bit premature, but a big part of that is the two scholarship freshmen we brought in have not been able to see the court. James Reuter had 16 points and 6 rebounds and Celso Sanz had 9 rebounds. Final Score: Abilene Christian - 54, North Carolina Central - 67. Another long scoring drought did us in. James Reuter had 20 points and Nickolas Toy had 12 but nobody else could get much going. Celso Sanz had 9 rebounds but it is scary how outmatched we have been by the worst teams in basketball. With the level we are currently playing at I don't see us winning more than 1 or 2 road games the rest of the season. Final Score: Omaha - 58, Abilene Christian - 46. Earlier I said we may only win 1-2 road games the rest of the season. I don't think we will win another game this season. Philip and Sanz had 10 points each and Mitchell had 10 rebounds. This team is just not good and has regressed instead of developed. Final Score: Sam Houston State - 65, Abilene Christian - 39. This was the best team we have played all season so the defeat was not a surprise. Henry Hughes was our leading scorer with 10 points and Michael Mitchell had 6 rebounds. We are currently 349th in the country in points per game. An interesting stat for us this year is we are 1-0 against teams 51-100 in RPI. 3-2 against teams in 101-200. And we are a whopping 0-6 against teams 200+. Our RPI is dead last for a second straight year. Final Score: Abilene Christian - 56, Lamar - 47. James Reuter had 20 points but this offense is just so bad that wins are hard to come by. Things started out good for us this season but right now all we can do it hope next season gets here. C David Pellerin has declined our scholarship offer and will be attending Missouri State. He was someone I didn't expect to get but would have been a huge pickup. On the other side of things, PG Chung McLin from San Angelo, Texas has committed to us next season! McLin is an all-around scorer who can drive to the hoop as well as hit the mid-range and 3. He is a good ballhandler but isn't much of a distributor. His defense is solid but unspectacular and he is someone who may fit in best as a SG for us instead of PG. With the month ending that means the academic suspensions have been finished! Douglas Arguello will remain redshirting to develop his game but Virgil Yager will be inserted into the starting lineup immediately in place of Celso Sanz. Final Score: Abilene Christian - 66, Incarnate Word - 60 in OVERTIME! Henry Hughes hit a buzzer beater to send us to overtime after Incarnate Word only made one free throw with 9 seconds left to leave us with a chance. Jonathan Philip had 22 points and Celso Sanz played well off the bench with 7 rebounds. Our free throw shooting was huge in this one as we went 22-26 from the line. Michael Mitchell had 8 points and 12 rebounds and in his debut Virgil Yager fouled out with 12 points and 4 rebounds. Eric Newcomer of Incarnate Word had a hell of a game with 29 points as he went 10 of 11 from the field and 7 of 9 from the free throw line. He is a freshman and someone I will dread facing in the future. This is a good start to our "2nd half" of the season with Yager. Final Score: Texas A&M Corpus Christi - 37, Abilene Christian - 46. James Reuter and Virgil Yager both had 10 points and Michael Mitchell had 10 rebounds. Nickolas Toy and Tom Johnson had 8 points apiece as well. After a terrible stretch of 8 straight losses these past two games have been a breath of fresh air. Final Score: Abilene Christian - 46, McNeese - 63. We only shot 33% from the field and committed 17 turnovers which did us in. Virgil Yager had a big game with 19 points and Nickolas Toy did a bit of everything with 6 points, 4 rebounds, and 5 assists. Michael Mitchell had 9 rebounds and we had no points from the bench. Final Score: Northwestern State - 42, Abilene Christian - 51. We overcame 19 turnovers in this one thanks to 17 points from James Reuter and 13 rebounds from Michael Mitchell. The bench had 15 points and Celso Sanz even had 4 assists off the bench. This gets us to .500 in conference play and ties us for 6th place. Texas A&M Corpus Christi is first in the conference at 5-1, and their one loss was to us. Final Score: Abilene Christian - 78, Southeastern Louisiana - 68. This was probably the best game we've ever played as we scored an unprecedented (for us) 78 points. James Reuter had 25 points and Nickolas Toy was named player of the game with 19 points, 7 rebounds, and 4 assists. With that win we are up to 4th place in the conference. Final Score: Abilene Christian - 65, Houston Baptist - 67. We blew a double digit lead due to 16 turnovers including two in the final minute of play. James Reuter had 17 points and Jonathan Philip had 10 points with 7 rebounds. The bench had 17 points in this one but we shot 38% from the field to Houston Baptist's 49%. This would have been a huge one to win. Final Score: New Orleans - 58, Abilene Christian - 48. James Reuter had 23 points and 7 rebounds but we committed 17 turnovers which did us in. That combined with going 17 for 30 from the free throw line. We find ourselves in a lot of winnable games where we aren't getting beat as much as we are simply just losing them. Michael Mitchell had 11 rebounds. Final Score: Abilene Christian - 56, Sam Houston State - 79. Jonathan Philip had 11 points and the bench scored 18. We were thoroughly outplayed as we committed 8 more turnovers than Sam Houston State and they show 9-17 from three. Junior College Center Basile Decourchelle has declined our scholarship offer to attend Mississippi State. Final Score: Lamar - 62, Abilene Christian - 51. We were atrocious in this one and did not deserve a win. Tom Johnson had 14 points and Jonathan Philip had 11 points and 7 rebounds. Final Score: Abilene Christian - 56, Northwestern State - 75. We were down by double digits almost the entirety of the game. James Reuter had 10 points and Jonathan Philip had 12 points. This loss puts us down to 12th place in the conference. Final Score: Abilene Christian - 55, Stephen F. Austin - 70. Virgil Yager had 12 points and Jonathan Philip had 18. The bench came up with 16 points but it wasn't enough to make much of an impact. Final Score: McNeese - 61, Abilene Christian - 47. Jonathan Philip had 15 points and only one other player topped 6 points. We are on a terrible stretch right now and we are desperately awaiting the end of the season. Final Score: Abilene Christian - 54, Texas A&M Corpus Christi - 66. James Reuter had 13 points and Michael Mitchell had 10 rebounds. Our losing streak extends to 8 games and I'm not sure if we'll win another game this season. Final Score: Nicholls - 54, Abilene Christian - 49. Jonathan Philip had 12 points, Nickolas Toy had 10, Virgil Yager had 11, and James Reuter had 9. The losing streak has reached nine and puts us to 0-6 this month. Final Score: Abilene Christian - 60, Central Arkansas - 48. The losing streak comes to an end! James Reuter and Jonathan Philip both had 17 points and Michael Mitchell had 10 rebounds in a game that gives us a one game "lead" over not being last place in the conference. I had much higher hopes for this season but simply avoiding last place is all the Athletic Director wants. Final Score: Southeastern Louisiana - 60, Abilene Christian - 45. Jonathan Philip had 12 points and James Reuter had 9 rebounds in the game that clinches our 20th loss of the season. Fortunately we were able to avoid last place in the conference. Here is the final conference standings this season. We did not qualify for the conference tournament. McNeese won the conference title and is a 15 seed in the NCAA tournament! Here is how the 1939-1940 Season wrapped up. In the Southland Conference the player of the year was sophomore SG Thomas Wise from Sam Houston State who averaged 12.2 points, 4.2 rebounds and 2.9 assists. The Freshman of the year was SG Kevin Bentley from New Orleans who averaged 14.9 points, 4.3 rebounds, and 1.4 assists. The coach of the year was David Cason who led McNeese to a 22-10 record (10-4 conference record). 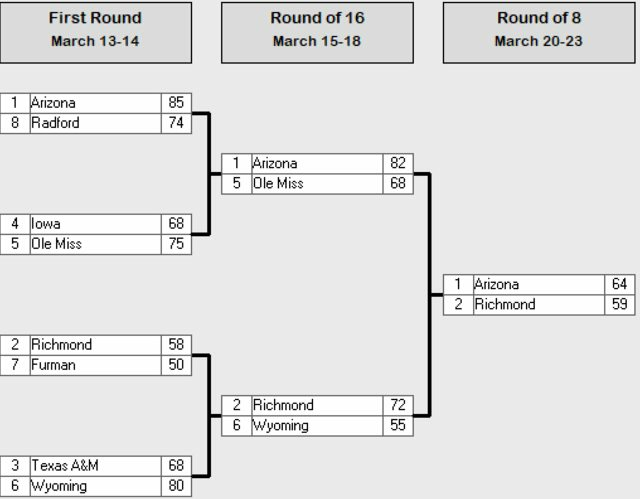 First up is the West region! 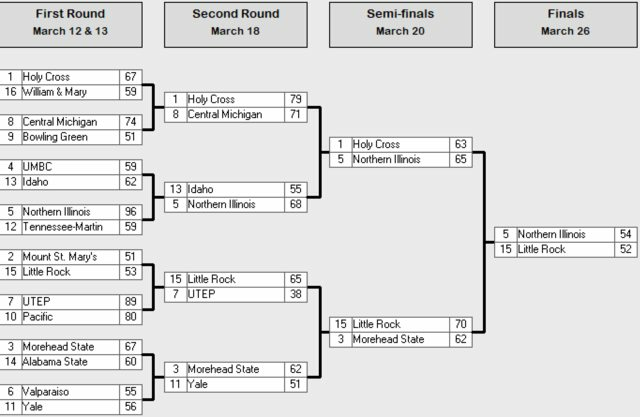 The first round saw our conference representative McNeese lose in the first round as a 15 seed to 2 seed Wisconsin. 12 seed George Mason beat 5 seed Oregon and 10 seed Marquette beat 7 seed Tulsa. 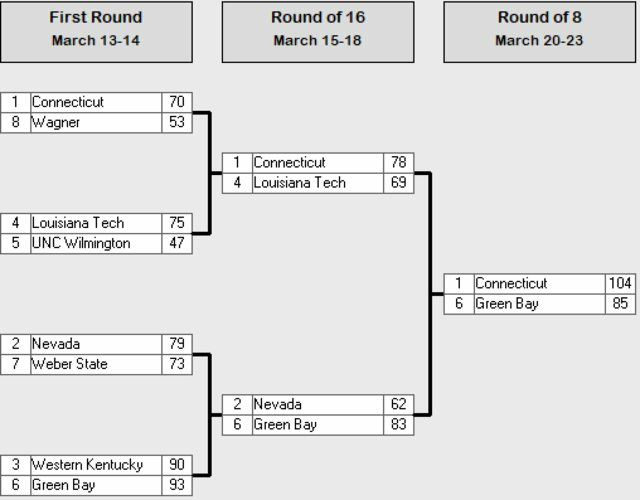 The 2nd round saw 2 seed Michigan State beat 1 seed Wake Forest. 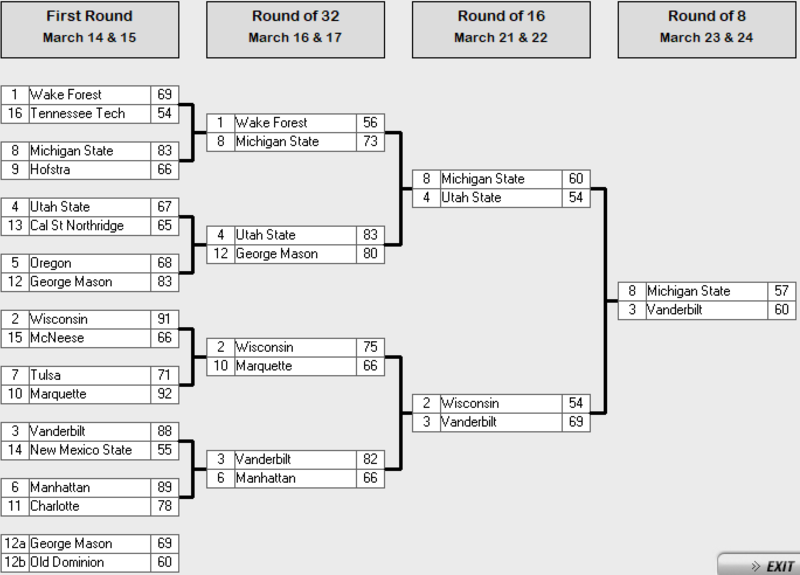 Michigan State then beat 4 seed Utah State in the Sweet 16. They then lost to 3 seed Vanderbilt who punched their ticket to the Final Four! 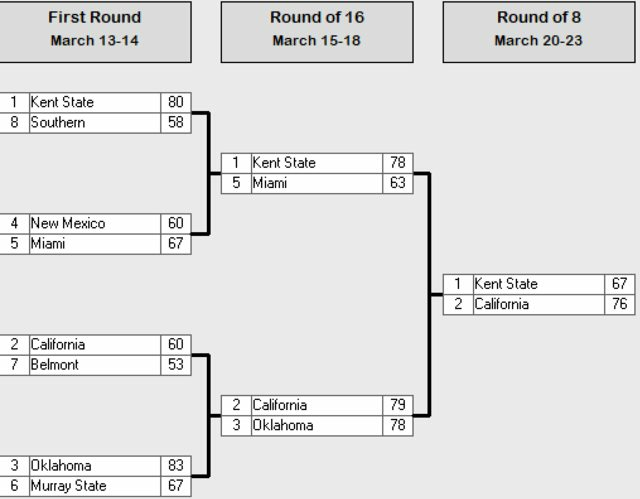 Next up is the Midwest Region. The first round went just about as expected with the only upsets being 11 seed Oklahoma State over 6 seed Memphis and 9 seed Kansas over 8 seed Virginia. Kansas then knocked out 1 seed Dayton in the second round, meaning through the first two regions no 1 seed has advanced to the Sweet 16. Oklahoma State also advanced to the Sweet 16 by beating 3 seed Notre Dame. Kansas was knocked out by 5 seed Michigan but Oklahoma State beat 2 seed Creighton and then beat Michigan to advance to the Final Four as an 11 seed! Now on to the South Region. 11 seed Rider beat 6 seed Arkansas, 10 seed Southern Mississippi beat 7 seed USC, and 9 seed Georgetown beat 8 seed UCLA. None of those teams could win in the 2nd round and the Sweet 16 featured the 1, 2, 3, and 4 seeds. 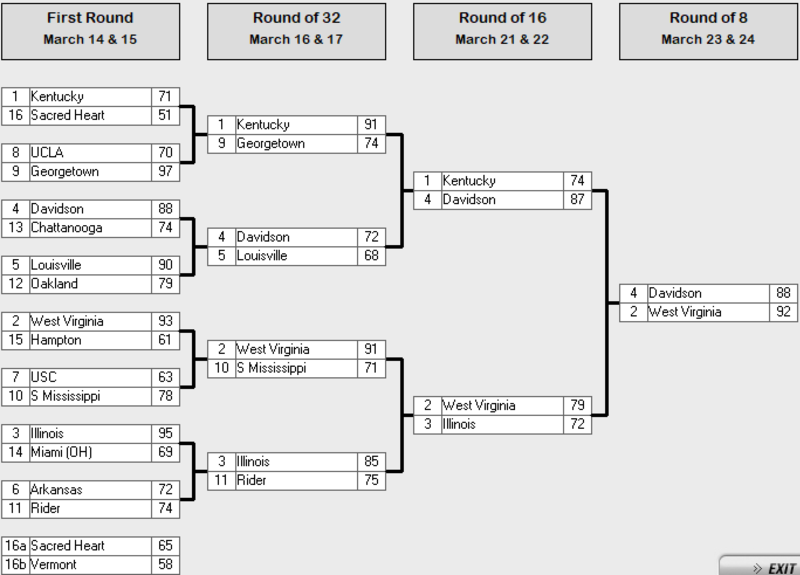 2 seed West Virginia beat 4 seed Davidson in the Elite Eight to punch their ticket to the Final Four! Finally we have the East Region. 12 seed Syracuse beat 5 seed UAB, 11 seed NC State beat 6 seed Siena, 10 seed Missouri State beat 7 seed UNLV, and 9 seed Saint Joseph's beat 8 seed Villanova. Only one of those teams could pull off a second round upset as NC State beat 3 seed Maryland. Then they beat 2 seed Florida. 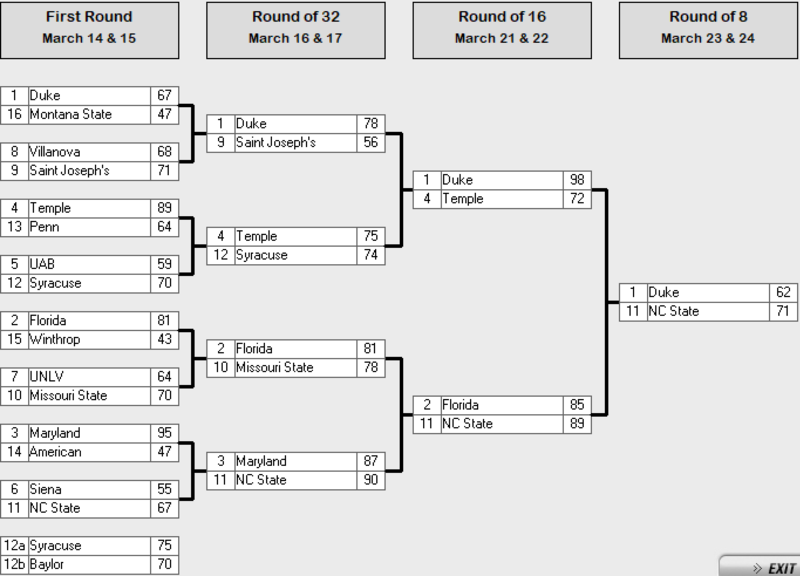 Then they beat 1 seed Duke to advance to the Final Four! 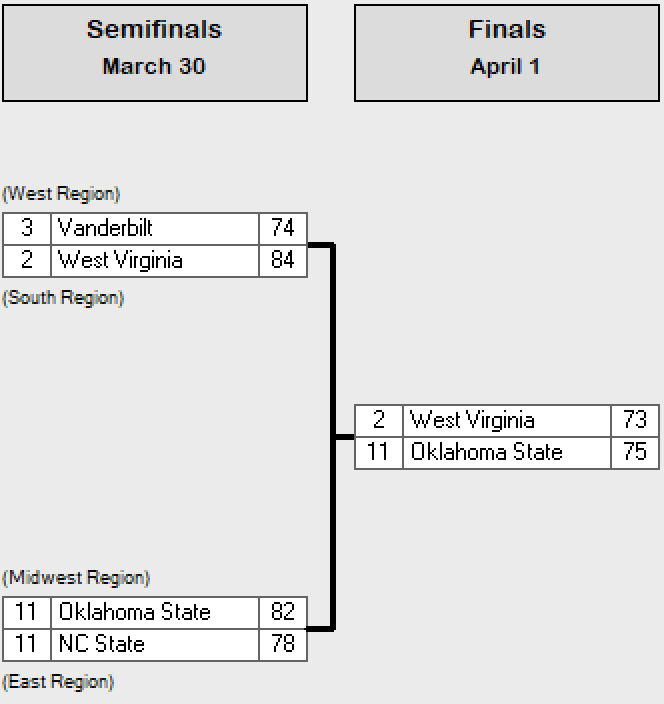 2 seed West Virginia took down 3 seed Vanderbilt and in the battle of the 11 seeds Oklahoma State beat NC State! Amazing to see two 11 seeds make the Final Four. In the championship game Oklahoma State continued their amazing run and beat West Virginia in an absolute thriller winning by the score of 75-73. Congratulations to Oklahoma State! 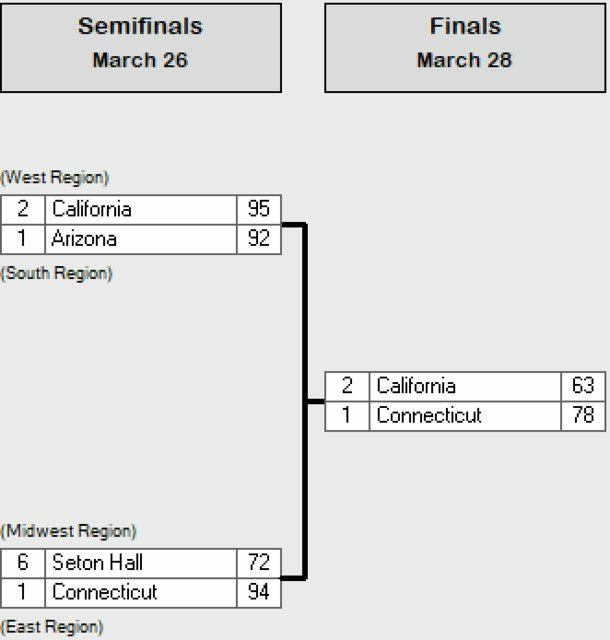 Congratulations to the University of Connecticut on winning the NIT by defeating Cal. Sam Houston State represented the Southland in the CBI as a 12 seed and took down 5 seed Troy in the first round but lost to 4 seed Bradley in the 2nd round. Bradley ended up winning the tournament over 6 seed Akron! Northern Illinois beat Little Rock to win the CIT! We had 4 seniors this year and all of them were on scholarship. Only one played a big role during their time here though and the other 3 all came off the bench. Our first senior is SF James Reuter from Conroe, Texas. Reuter started 59 games in his career and averaged 9.6 PPG with a career high 12 PPG this season. He also averaged 3.6 rebounds and 1.2 assists. His career highs were 25 points, 9 rebounds, and 4 assists. He was named player of the game 5 times in his career. Our next senior is PF Charles Hurley from Kenedy, Texas. Hurley appeared in 35 career games, all of the bench, and averaged 9.9 minutes per game. He averaged 2.2 points and 2.1 rebounds with career highs of 6 points and 5 rebounds. Our 3rd senior is PG Ali Morales from Mineral Wells, Texas. Morales appeared in 56 career games, all of the bench, and averaged 5.1 minutes per game. He averaged 1.6 points in his career with a career high of 10 points. Our final senior is PG Tom Johnson from Lubbock, Texas. Johnson played in 59 career games and started only one of them. He averaged 13.1 minutes per game to go along with 3.9 points. His career high was 14 points. We would like to thanks these seniors for their time spent on the team! We took a step back this year at 9-20 but I cannot say I am too surprised given that we lost both of our starting big men and weren't able to bring in much to replace them with. It definitely hurt that we had a walk-on freshman starting and that our top two recruits were suspended due to academics to start the season. Things weren't too bad to start the season but we got on long losing streaks where we just looked totally inept at scoring which is something that doesn't surprise me given the lack of developed talent on the team. As you can see we were 350th in scoring and pretty much absolutely awful in every aspect of the game. The bright side to this is that at least we ended 346 in RPI which is an improvement over last year. We had our first conference movement as Gonzaga left the WCC for the Mountain West in place of San Jose State who will be joining the WCC. As you can see we have 5 seniors which means we will have a lot of recruiting to do this offseason. We have a lot of young guards so finding big men will be priority #1. As you can see I am trying to be very ambitious and am going after as many big men as I can in hopes we can bring at least 2 in. With 5 scholarships available I don't want to force any to undeserving players and we may hold one over until next year. We scheduled another slew of bad teams to try to boost our win totals this year. Hopefully it will help us push closer to an overall winning record but at the very least should keep us out of the dreaded 3-5 win total for the season. C Terrance Doud has been suspended due to academics. He was unlikely to factor into any games for us anyways. The goal is to again avoid last place in the conference which I feel confident that we can do. 6th - PG Mark Gagne (FR) - Gagne is not going to be relied on as a scorer but provides solid handles and defense off the bench while having the ability to force a turnover at any moment. 7th - PG Nickolas Toy (SR) - Toy has been demoted to a bench player this season. He will be a reliable senior leader on the floor since our entire starting lineup is all underclassmen. 8th - PF John Gaudette (SR*) - Gaudette is a scorer on the inside. He isn't amazing at it but he can get it done. His defense is lacking which make him and Mitchell polar opposite players. 9th - PF Michael Mitchell (SR) - Mitchell is not a scorer but will be a defensive presence. 10th - SG Jonathan Philip (SR) - Philip has been demoted to the bench and probably won't see all that many minutes this season. We probably won't ever go much deeper than this unless foul trouble hits. This is definitely the best team we have fielded as far as talent goes. The little "indicators" that are colored next to each player's name showing their current and potential ability have always been red for current for every single player we have had. Only Nickolas Toy and Virgil Yager have had potential higher than orange (both have yellow). This season though we have four players who are Orange and I'm hoping that it will show in the final results. Our defense should be about the same but our offensive ability should be improving a lot. In he past our "Pace" has always been 0 or 1 but this year it is up to 7 as we finally have the pieces to have a little faith in our offense and not just to grind out a low scoring win. I know I am probably just being overly optimistic since I said this last season but I am very excited for this season.